Homemade Southern Buttermilk Biscuits with flaky layers! 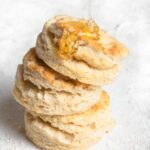 Easy and quick to make biscuits, perfect for breakfast! Add butter and mix with pastry grinder or by hand. Mixture should begin to thicken as butter is incorporated. When the butter is reduced to the size of oats, pour in your buttermilk. Stir with wooden spoon or mix in with hands. You may see tiny hunks of butter and that's fine! Transfer dough to a lightly floured surface and shape into a rectangle about 6x9 inches. Take the left side and fold into the middle, repeating with the right side, like a trifold brochure. Reshape into rectangle and cut out biscuits. Use a 3-4 inch biscuit cutter, pressing and lifting straight up. This should yield 6-8 large biscuits. Place biscuits on prepared sheet and bake until golden brown, about 10-12 minutes. Serve warm right out of the oven with your favorite toppings!